Fall's cooler temperatures bring on cravings for homey, warming dishes that make us feel cozy. These hearty chicken dishes showcase some of our favorite fall ingredients, from mushrooms to root vegetables. With the kids back in school and the holidays up ahead, it's a busy time of year, so we've chosen recipes that will help families get a delicious meal on the table without spending too much time in the kitchen. Whether you're craving the traditional comfort of chicken pot pie, need an easy weeknight dinner, or want to impress guests with little effort, here are a dozen takes on chicken that'll do the trick. Chicken cutlets in a delectable sauce make a great family dinner, but this dish is also fancy enough to serve to invited guests. 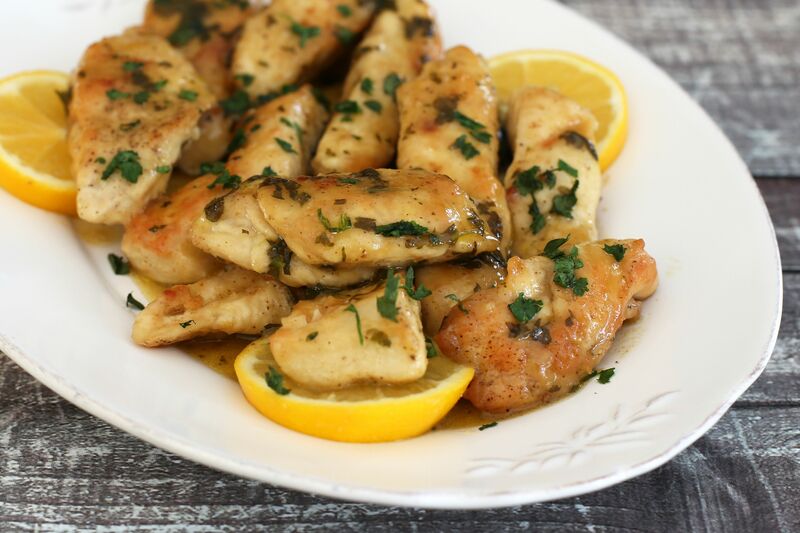 Best of all, you can have this chicken piccata on the table in less than 30 minutes. Treat your family to the Southeast Asian flavors of a fragrant Thai chicken and vegetable stir-fry, with a foolproof sauce that pleases every palate. Green beans, mushrooms, and bell pepper strips are added to the pan with the coconut milk-based sauce in a one-bowl dish dinner your family will ask you to add to the usual weeknight rotation. Your family will love digging into this popular 30-minute spaghetti casserole (it's also a wonderful Thanksgiving potluck dish!). Budget-friendly chicken breast halves, condensed cream of mushroom soup, tomatoes, and pimientos add big flavor to the sauce. Here's a great autumn dinner for the days you're craving something hearty and filling. 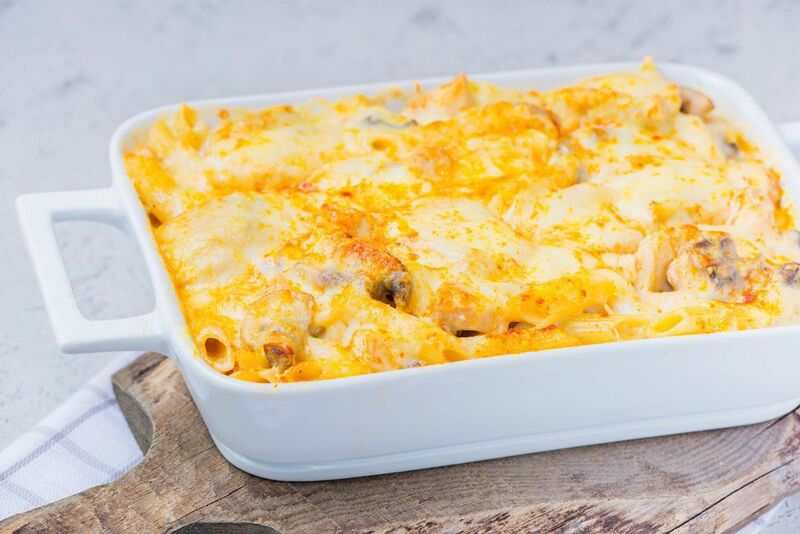 This chicken, cheese, and penne pasta bake is a satisfying family meal, with artichokes and mushrooms adding extra nutrition and texture. You can toss in any other favorite vegetables as well or add cheddar cheese in addition to the mozzarella, depending on your family's tastes. When you think about warming fall meals that make you feel cozy, doesn't this classic American comfort food come to mind? It's the perfect way to use up leftover roast chicken and whatever veggies are still sitting around in the fridge. This traditional recipe delivers fabulous flavor and is such a great one to have in your culinary repertoire. There's something so wonderful and comforting about the combination of juicy chicken and earthy, tender mushrooms. This super easy recipe featuring both ingredients takes a shortcut with condensed cream of mushroom soup, so it's ready in just an hour. The chicken and sauce makes a wholesome family meal with potatoes or noodles and a salad. It doesn't get more elegant—or easier, in this case—than a roast chicken for dinner. This wonderful recipe for a lemon and herb roasted bird produces one that's tender, juicy, and crispy. Serve it when you're having company over or on fall weekends with the family. Busy weeknights don't have to mean boring dinner—or resorting to take-out! This recipe for apricot lime chicken and vegetables is made on a single sheet pan, proving you can turn out a homecooked meal, even when you're pressed for time. The beauty of the one-and-done dinner is that you don't have to do much besides mix up a quick marinade, arrange the chicken and vegetables on the pan, and slide it into the oven. Rich, decadent chicken meatball alfredo is a fabulous recipe on those cool fall evenings when you want a dinner that will stick to your ribs. The pasta meal is a family favorite that's so easy to prepare, especially using store bought chicken meatballs and prepared alfredo sauce. Cream cheese is added to the sauce for extra tangy flavor, smoothness, and richness. Warm and comforting chicken and mushroom soup is full of flavor and perfect for enjoying on chillier days. Packed with healthful ingredients, including diced chicken breasts, carrots, celery, and fresh sliced mushrooms, the soup gets its creamy, velvety texture thanks to some heavy cream added near the end. It makes a wonderful first course, lunch, or supper soup—just add a sandwich or salad. Chicken and bacon are a flavor combination that's surprisingly delicious and this one-skillet recipe takes just minutes to prepare and cook. Bacon infuses the breasts with plenty of great smoky flavor, while balancing out the sour cream sauce, making it a great choice for everyday fall dinners. Want to impress dinner guests, but don't want to blow your budget? This elegant and easy entree for chicken and bacon in puff pastry serves a group of six. The sophisticated combination of bacon, chicken, onion, and cream cheese in flaky frozen puff pastry is perfect for company, yet so easy to make! You can make the filling ahead of time, then assemble the little bundles just before you're ready to eat.